POTATOES ARE THE MOST PERFECT FOOD EVER. If I could I would eat potatoes every single day. I don’t and I hold myself back but I do incorporate them into my diet a lot. The other day I was in the mood for a French fry but didn’t want to fry them or drive to McDonald’s and get some so I decided to bake them. I was eating some baked chicken wings and they really needed a potato side dish that would be pretty quick and easy. Heat your oven to 425 degrees. While it’s preheating wash and chop up your potato into a nice steak fry thickness (leave the skin on). 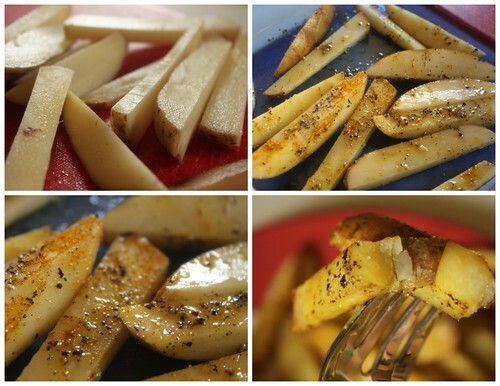 Drizzle a bit of olive oil over the potatoes, sprinkle with salt, pepper and curry powder. 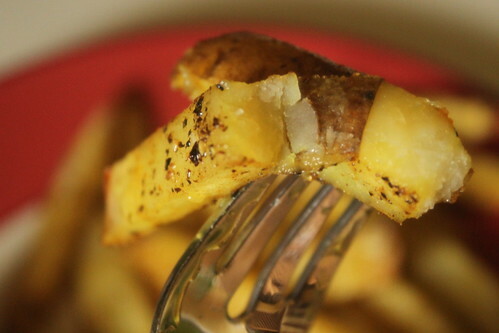 Mix them all together with tongs to get the seasoning all over the potatoes. Bake for about 20 minutes and then enjoy.